ed note – I’m oh so tardy in posting this article – please don’t let that inhibit any writers from sending articles for the blog. I promise to do better! Since I have become accustomed to ending my year of windsurfing by signing up for the Fall BABA trip to Cape Hatteras, I was very disappointed to learn that a work commitment would prevent me from attending the 2015 trip. A quick internet search soon presented an appealing solution. I would attend BABA but only Thursday through Saturday and sign up for Andy Brandt’s ABK Windsurfing Clinic the following week. This would get me a week and a half in Hatteras! I’d been thinking about attending ABK for a while. My windsurfing skills had improved a lot over the past few years due to quadrupling my time on the water. I was handling more wind, had moved to a much smaller board, and was gradually improving. I did, however, sense that my sailing needed an intervention of sorts in order to progress further. Sure, I’d developed into a straight line windsurfer with a decent non-planning dry pivot jibe, but I wanted more, such as the Heli tack , back wind sailing, the duck jibe, and , of course, windsurfing’s glass ceiling, the carve jibe. I arrived at ABK with a strong desire to advance in all aspects of my sailing. It did not take long to realize that I would learn a lot during the week. After introductions, Andy asked which sailors had decent tacking skills and I envisioned my slow, shaky, 15 mini-step tack. Andy pointed out that strong tacking skills are essential for the windsurfer as they come into play when you really want to get back in off of the water. So I headed off with my group of similarly skilled windsurfers for my first clinic of the week with a feeling of disbelief that it would be on tacking. After the clinic, I was truly shocked to realize how much there is to learn regarding what seems like the most basic of windsurfing maneuvers, but Andy’s instructors break the technique into small steps that result in instant success. This was my first big lesson of the week—learning that building on light wind skills translates into success in the higher wind skills. Regarding tacking, I learned the proper foot/hand positioning, when to shift my weight, how to manage the sail, and exactly when to make the move to the new side the board. In the coming clinic days, I would learn similar techniques as I progressed through a series of gradually more challenging maneuvers, such as the sail 180, sailing back winded, the switch footed pivot jibe with sail duck (a really cool way to learn the sail duck in light air), the 5 gears from getting planning early to blistering fast speed, etc. Each morning the ABK group would get together for a meeting (don’t be late or Andy will give you the business). At the end of the meeting, Andy would announce the various clinics offered that morning, then I would start to head off to the carve jibe or duck jibe clinic, only to hear a chorus of “Dave, Dave, DAVE” and be steered to the appropriate session for my skill level. I did eventually get to the carve jibe clinic and the following session on the water I made immediate progress. Also, Andy put on a free evening clinic at Ocean Air that included details on the planning duck jibe. The instructors video tape the water sessions and each day ends with video analysis of each sailors moves as critiqued by Andy. Some of the sailors where very skilled and I was amazed at the tiny tips that Andy would provide to improve, like rotating the thumb from the top to the outside of the boom for a more effective sail maneuver. 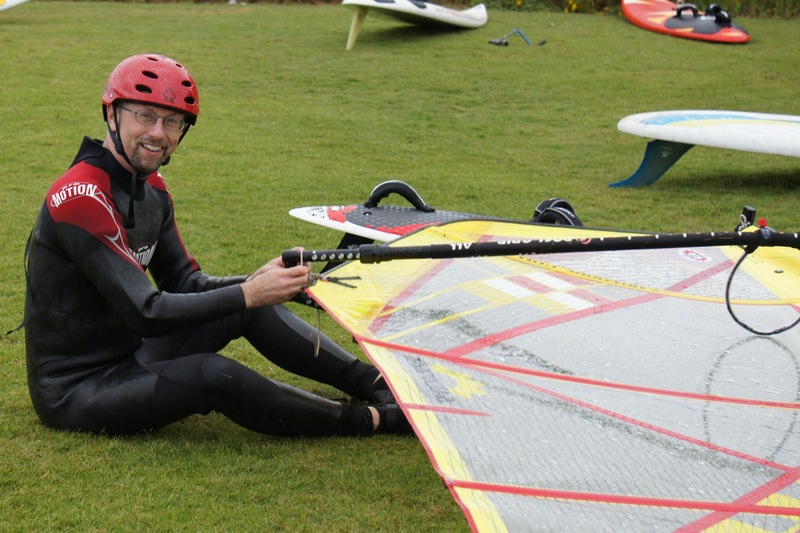 Andy is a terrific windsurfing kinesiologist and should have an honorary PhD in the sport. Regarding the video, they seem to keep clips that are most beneficial for instructing the sailors and immediately delete the rest. I found this helpful in terms of not having a room full of fellow sailors view my more awkward failures. In addition to sailing skills, there were very informative sessions on the latest advances in equipment and how to properly tune gear for conditions. Many of the windsurfing videos currently available for purchase are quite dated and we learned the latest techniques for the more modern equipment. I had originally been concerned that I would hit a no wind week for the clinic but soon realized that I would learn a lot regardless of the conditions. The site of the clinic, Barton’s shop in Waves (aka Hatteras Island Surf Shop), is a terrific spot for learning—shallow and well exposed to many wind directions. We had our best wind on the last day and I worked mostly on my carve jibe and was very pleased with the instruction and my progress. All in all, I was very surprised that I learned as much as I did and I have many new skills hone. Mayo Beach Fun Fest 2016 – It was fun!